How can you tell if you’ve bought an imitation perfume but paid a genuine price for a fragrance? 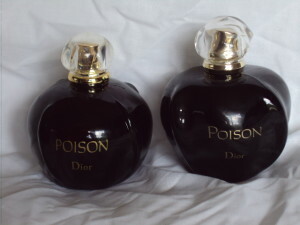 I recently bought a new bottle of Poison by Christian Dior from a reputable seller. 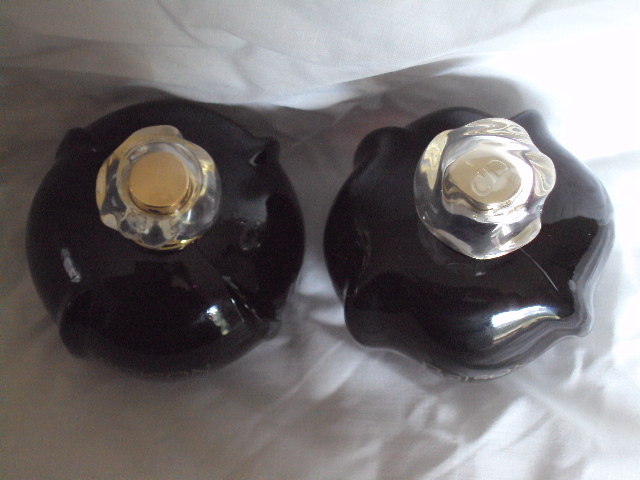 I bought a second bottle from eBay (as an experiment) which was sold as an unwanted gift. There was one photo of the product on the eBay listing which looked like the genuine article. The box and product looked the same as the products I had seen online from reputable sellers, so I purchased the bottle. When I got both bottles, I put the bottles side by side and noted the differences. The imitation bottle is on the left. I apologize for the lighting in the photos. I found a number of differences. Firstly the imitation bottle was smaller/shorter in size and the writing on the face of the bottle was different (but also similar). Notice the larger P on the Poison in the genuine article. 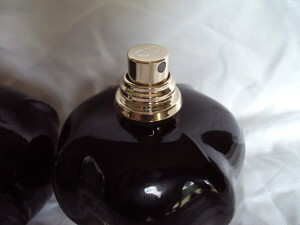 Secondly, the spray nozzle on the imitation bottle was a brassier gold with no CD on the top. All of the Christian Dior bottles that I have ever bought have always had a CD on the spray nozzle. I’m not sure if this is a standard production feature of all Christian Dior bottles though. I do have 13 Dior fragrances in stock at the moment and they all have CD stamped on the spray nozzle. Thirdly, the bottle cap on the imitation looks cheaply made and is smaller than the genuine product. The genuine article has smoother edges and no indentation in the middle. 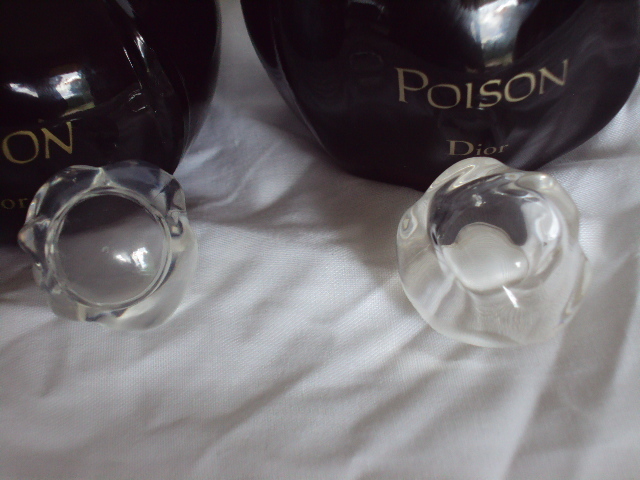 The fourth point of difference is the bottle shape itself. You notice on the imitation on the left that there is an imperfection at the top near the nozzle and the edges of the bottle are not as smooth and don’t stand out as much. The genuine article has no such flaws. It has no visible joins like the imitation (at the base) and looks to be of good quality. The fifth point of difference is the spraying of the bottle. The genuine article has a smaller stream of spray and is more direct. 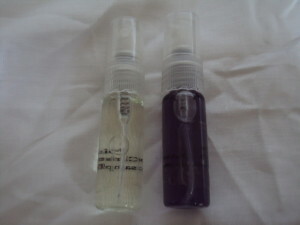 The imitation has a wider spray range with less fragrance being sprayed out. I have found with the more expensive brand perfumes, the spray nozzle sprays better and has a more direct spray pattern. My sixth observation was the sticker on the base and the shape of the base itself. I’m not sure if you can see this from the photos but the imitation sticker on the base is barely readable. I had to remove the sticker to see what it said and it was in orange print. The genuine sticker is clearly read and it is in gold writing. 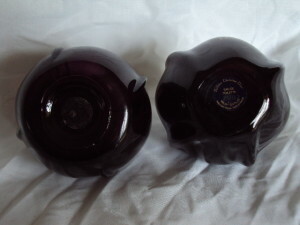 The imitation bottle has an indented base and you can clearly see visible marks in the glass where the bottle has been joined together. The base on the genuine article was flat and smooth with no visible join marks. 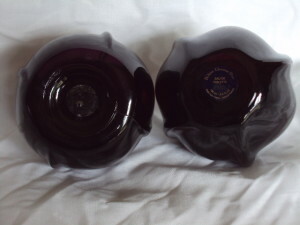 The edges of the bottle were also well made and smooth on the genuine bottle, as opposed to sharper and smaller edges on the imitation bottle. One of my last observations was the colour of the perfume. 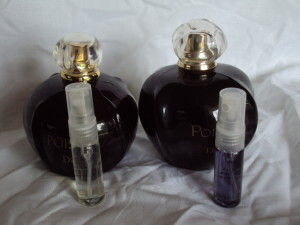 As you can see in the photo, the imitation perfume is clear in colour and the genuine perfume is purple in colour. 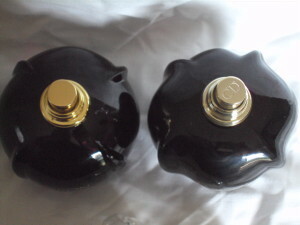 I cannot show you a photo of the smell of the perfume obviously but the imitation was very faint and quickly faded. The genuine article smelled stronger and lasted a lot longer on the skin. Now the question remains, how do I tell if the perfume that I have just bought is a fake or genuine? If you are buying from a reputable seller such as Myer, David Jones, a Chemist/Pharmacy – you can almost guarantee that you are buying the genuine article. 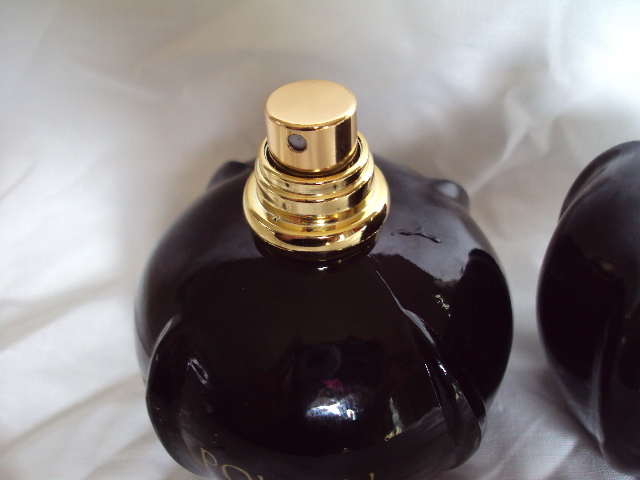 But if you buy from eBay or another source, you need to know a few things about your fragrance. What does your perfume bottle look like? What are its distinguishing features? What does the packaging look like? It’s easy to tell when you’ve got the genuine article standing next to an imitation but you may need to do some research. Ask questions from those in the know. Check your genuine bottle at home and ask the seller questions. If it is a genuine article, I’m sure they will not shy away from questions such as where they bought it and whether there is a CD stamped on the spray nozzle. Unfortunately, some people have no qualms about passing off an imitation as a genuine article but as the buyer we need to be savvy. It’s your money you’re spending after all. You should be getting what you pay for. And the old adage, if it’s too good to be true then it probably is. But having said that, there are some genuine bargains to be found on genuine fragrances from genuine buyers.